Teenagers who reported for Substance News that they had been excluded from the Charter Schools Family Picnic on Saturday, September 12, had an invitation to the event, but were nevertheless excluded when they told event organizers, honestly, that they were not charter school students. 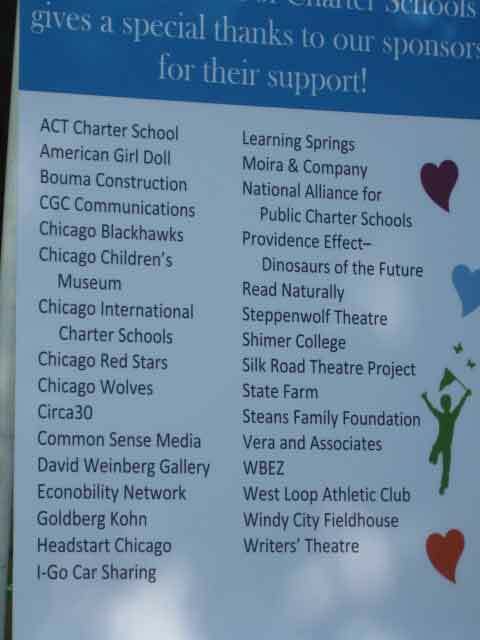 The Illinois Network of Charter Schools (INCS) received financial support from the organizations and individuals listed above for their "Family Picnic" on September 12, 2009 at Garfield. Despite sending an invitation to Julian High School students through teacher Xian Barrett, INCS then excluded the students, as reported earlier at substancenews.net, when they took public transportation across town to attend the event. Substance photo by Xian Barrett.A copy of the invitation follows. It was sent to Xian Barrett, a teacher at Julian High School, by e-mail on September 9, 2009, by Mireya Vaca of the Illinois Network of Charter Schools (INCS). From: Mireya Vaca Subject: Reminder: 2009 Charter Family Picnic is THIS Saturday, September 12th! Join INCS and the rest of the charter school community for a FREE day of fun, music, good food, and great raffle prizes! We will be there, rain or shine! Directions: There will be limited FREE parking available at the Garfield Park parking lot and on the street. Garfield Park is easily accessible via public transportation. If traveling by train, walk south from the "Conservatory-Central Park" Green line stop to reach the picnic area. If traveling by car, take the Eisenhower Expressway (I-290) and exit at Independence Blvd. (Exit 26A). Turn right (east) onto Washington Blvd and then turn left (north) onto Central Park Ave.
For a map to Garfield Park, click here. For more details, check our picnic website. The reason for posting this information at www.substancenews.net is that one blogger on another site (District 299.com, which is sponsored by Catalyst magazine and the Chicago Tribune) stated, flatly, that one of our sources for the story was lying. The blogger, "Danny" (Danny Van Over, a teacher at Chicago's Taft High School) provided no sourcing for his attack on the students and teacher who reported the incident here at Substance. "Re: "Charter event kicks out public school students"... Unfortunately, this is one of those contrived "stories" that give Substance a bad name. "Let's recap: Julian HS foreign language teacher Mr. Barrett manipulates three of his students to crash a charter school event for students and supporters of charter schools and paid for by donors to same charter schools. "They are told that party crashers are not welcome in the grove reserved by the event. They may, of course, use the remainder of the public park. "The three complain that they are not wanted because they are public school students, and whine as if they are somehow entitled to play games and eat food for which someone else has paid. "And Mr. Barrett gets his headline in Substance that makes the charter schools look bad..."
That was the beginning of the story, following a Catalyst decision to post a link to the Substance story, which began running on Sunday, September 13, and was locked in after editing later that day. And will remain on our September 2009 Home Page for all eternity, just as the postings to "District 299.com" have the same life span in Cyberspace. Three charges in one posting is a lot for one simplistic posting, admittedly to a blog. The students and their teachers were invited. The invitation is quoted in full. Had Mr. Van Over wanted to check the claim (as we did), it was easy enough to call the Illinois Network of Charter Schools. But that's against the rules of blogging. For years, it's always been an honor, as an editor, to say: "We stand by our story." This trivial little example is one of those times. We stand by our story. We stand by all of those who reported it for Substance. And we stand by the integrity of what we publish, in our own names, on our own time, and at our own risk. That much can't be said for too many others in this town — especially in this school system. As our readers have known for 35 years, we protect off-the-record sources for news stories completely and forever. There are reasons why real people worry about retaliation for telling the truth in this town, as we ourselves have experienced rather vividly (see "Legal Fight" in Back Issues at our old Web site -- www.substancenews.com -- for a memory refresher in case you're too young to remember or have forgotten; the CASE test no longer exists thanks to Substance and our anonymous sources). But all sourcing and attribution has to be verified. Most recently (September 16, 2009) an anonymous source provided us with an exact copy of the letter Alderman Danny Solis sent to Michael Scott and Ron Huberman on September 1. We verified that before posting our story updating the UNO / De La Cruz controversy. It's an example of how reporting (as opposed to blovating) works. As for the weekend story about the hypocritical charter schools "family picnic: — we've also responded briefly at District 299.com as well. There are too many other stories coming in to waste any more time on one person's version of reality, but we had to take the time to defend the integrity of our reporting, our reporters, and our information.